Classic rockers The Who may have missed last weekend’s Sound Relief concerts in Sydney and Melbourne, but they will be doing their bit to raise money for the victims of the Australian bush fires in a special concert later this month. The band is booked to play at the Melbourne Grand Prix on March 29, with a portion of ticket sales to go to fire relief funds. A limited number of tickets – named Silver Reserve, My Generation Platinum & Who Are You Gold tickets – will be available in three premium general admission areas at the front of the stage for $125, $175 and $225 respectively, including general admission access to the circuit on the Sunday. $25 from every ticket sold will go towards funds set up to help the thousands of families left homeless by the bush fires that raged through Victoria over the last month. ‘The Who could not be here to take part in the Sound Relief Concerts, but we sincerely hope this new ticket initiative will add some well-needed funds to the appeal,’ said tour promoter Andrew McManus. "After the tremendous success of last year I wanted to present a band that was just as exciting and dynamic on stage, so we can continue the momentum of the spectacular F1 race straight into one of the world’s leading acts. 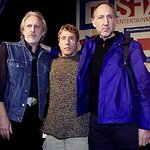 I had the opportunity of watching The Who headline the O2 festival in Ireland last year and was blown away by not only Roger Daltrey's vocals, but just the sheer magic coming off the stage from Pete Townshend and the rest of the band. The 2009 Australian Grand Prix can only get bigger and better with the inclusion of The Who!""